…and yes, the picture is in focus. This strange image was captured by the High Resolution Imaging Science Experiment (HiRISE) camera on board NASA’s Mars Reconnaissance Orbiter (MRO) on April 11th. At first it looked like a classic example of my early camera days without a tripod; most of the photos I took were blurry or out of focus (due to my less-than-perfect eyesight). So when I first saw this picture of the summit of one of the huge Martian ex-shield volcanoes, Pavonis Mons, I assumed it was a mistake; HiRISE either had the shakes or it had developed myopia. Pavonis Mons is one of the Martian “Big Three” ancient volcanoes situated on the Tharsis bulge. Second only to Olympus Mons (the biggest volcano in the Solar System, standing at a mighty 27 km above the Martian surface), Pavonis Mons certainly isn’t small. It reaches 16 km into the Martian skies where the air is so tenuous, it barely reaches a pressure of 130 Pa (compared with the 600 Pa mean surface pressure of Mars), that’s 0.1% the average sea-level pressure on Earth. When you have an atmosphere so thin at such high altitudes, there are consequences. 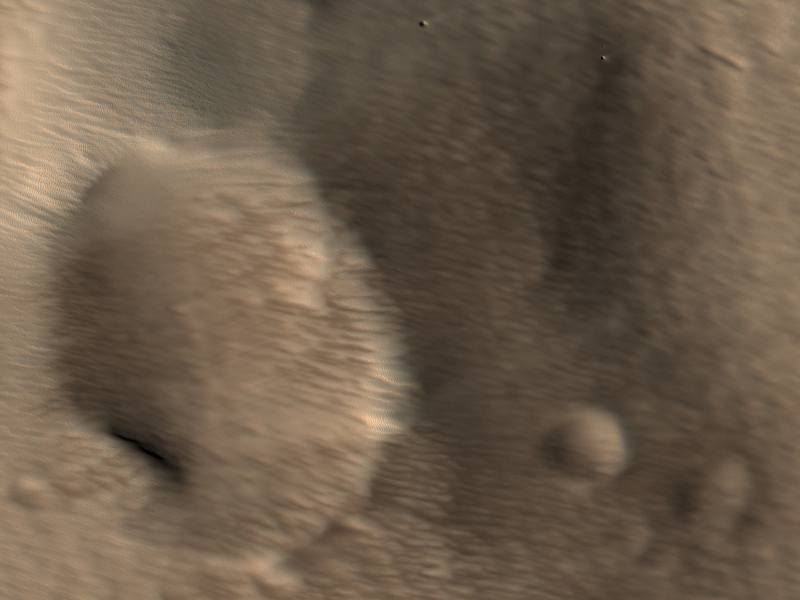 In the case of this HiRISE image, the issue is that the summit of Pavonis Mons becomes rather blurred. During major dust storms on the planet, huge quantities of dust can be deposited at the tops of these tall volcanoes, covering them in a thick layer. When the wind blows, it lacks the muscle of the thicker atmosphere found 16km below, so less dust is picked up and transported away. Although small ripples in the dust can be seen (highlighting the fact that there is a weak wind blowing up there), it doesn’t carve definite shapes into the regolith. Instead, it leaves a thick layer of fluffy, smooth dust to collect. When images are taken from space, it has a blurry appearance. In case you don’t believe me, look at this high resolution version of the image above, zooming into the top right-hand corner where you’ll see a small, recent (and in-focus) impact crater. Also, look at the focused ripples in the dust on the lighter northern edge of the volcano. Wow, that’s a weird effect! MRO rocks! what are the tow points on top on the right ? This is one seriously weird terrain. Another of those reminders of just how alien Mars really is. Fascinating place! I wrote about this on my blog, too, if anyone would like a look.. Previous PostPrevious Life Beyond Earth in 10 Years or Less?